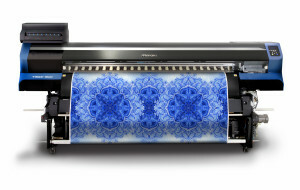 Mimaki announced the launch of the Mimaki TS55-1800, a new digital heat transfer sublimation printer, that brings high-end features to the entry and mid-level market. These features include high-speed one-pass printing at a high-resolution and high ink-density, unattended printing with the new Mini Jumbo Roll and Mimaki’s Nozzle Check and Recovery System for continuous operation. With the release of the TS55-1800, Mimaki delivers on making high-end digital textile printing features available to a much broader market. Now, textile professionals can effortlessly scale their operation with an affordable heat sublimation printer that meets the high quality and fast turnaround times demanded in the dynamic textile and apparel industry. The new model prints at a resolution of 480 x 600 dpi with a high ink density using one-pass printing at 140 sqm/h (1,506 sq.ft/h). In addition, the Mimaki Advanced Pass System (MAPS4) improves the quality of two-pass printing by eliminating banding. The TS55-1800 achieves all this with low running costs and the high-productivity and reliability that Mimaki products offer. One of the key features of the TS55-1800 is the optional use of new Mini Jumbo Roll unit that can continuously feed 2,500 linear meters of heat transfer paper to the printer. This enables customers to substitute the use of Small Plotter Rolls with Mini Jumbo Rolls, which can save them over 20% in print media cost. Furthermore, Mini Jumbo Rolls of Mimaki Vision Jet-X transfer paper, supplied by Neenah Coldenhove, will be offered as package deal with the TS55-1800. The 2,500 m² Mini Jumbo Rolls are the ideal way to upgrade to high-volume unattended textile printing. In addition, the printer is fitted with the unique Mimaki Nozzle Check and Recovery System and 10-liter ink tanks, which ensure failsafe continuous operation for extended operational periods, such as overnight-unattended printing. You can see the new printer at C!Print Madrid and Viscom Italia.